Strange, you think to yourself. But your friend sometimes has good ideas, so you type ‘urgggggggh’ into the podcast search menu. Nuttin. You check your spelling and search again for ‘urghhhhhhhh’. Again, no results. Ah well. You’ve got lots of other podcasts to listen to. A few days later it’s all over Facebook – your friend has vanished from the face of the earth. No-one has seen her. There’s just a weird, slime-like substance on her bed, and the outer casing of a smartphone. If you wish to sit and draft an emotional ‘come home soon’ plea to post on your friend’s Facebook page, go to paragraph 2. If you want to listen to the latest episode of Sword and Scale, go to paragraph 3. You head towards your office to get a pen and paper. There’s a sudden breeze that blows through your flat and your towel falls off. As you bend inelegantly to put it back on, you see an envelope has appeared near your front door. Impossible! you think, for various reasons, including the fact that the door doesn’t have a mail slot. You pick up the envelope. It has your name written on it in creepy old people’s handwriting. You open it carefully in case it’s full of anthrax. It’s not. There’s just an iPhone in there. An iPhone without its outer casing! It’s just some components and a touchscreen. Gingerly, you press the home button. It works. But there are only two apps installed. Someone has deleted all the other apps, including Stocks and Newsstand. What sorcery is this? If you click on the Podcasts app, go to paragraph 4. If you click the Photos app, go to paragraph 5. You press play on Sword and Scale. It’s an episode about a savage, murderous baby who targets people in your exact demographic. You are now mortally afraid of babies. LOSE 1d6 COURAGE POINTS and go to paragraph 2. The podcast playlist looks exactly like you’d imagine your missing friend’s playlist to be – esoteric hippy podcasts about crystals, things about feminism, quite a lot of podcasts on the topic of forehead care. There’s one that stands out as not her normal style. It’s in the ‘now playing’ section and it’s called Pick Your Path. You tap it – there’s a weird photo of a mustachioed man from the 70s, a gorilla with three heads, some sci-fi imagery. This is odd, you think to yourself, why does my friend have such an AWESOME-looking podcast? If you want to press play and listen to it, go to paragraph 6. If you want to read some reviews first, go to paragraph 7. If you want to sign up to Audible.com and receive two free audiobooks with no catch, go to this amazing Audible offer. The photo albums are all called ‘urrrrrggggh’ and when you browse them you initially think they are all stills from a horror movie. You know, creepy long-haired girls in white dresses, scary corridors, dead flies. But you soon realise that it’s your friend who has taken the photos – you can see her in some reflections and sometimes you recognise her distinctive knobbly knees. You gasp as you realise that she has laid the dead flies into deliberate order – to spell the phrase ‘complete mission free me’. Your eyes widen – did she really use the word mission instead of quest? What a waste of flies. But what quest could she be talking about? It must be something about podcasts, since that’s the only other app on the phone. You gain +1d6 damage in combat versus insects (of any size). Now go to paragraph 4. You press play. There is an ACE theme tune, then an introduction which explains the concept of the show (you love shows with introductions! It makes you feel safe!) followed by an explanation of how to listen and make choices. Sounds simple, you think. The first choices are easy, but soon the story is over. Of course you can’t just break into someone’s house! You’re not playing a video game! You smile – you never were very good at Choose Your Own Adventure stories, but you always liked them. You go back to the start and vow to make some different choices. YOU ARE HAVING FUN for the first time this year. 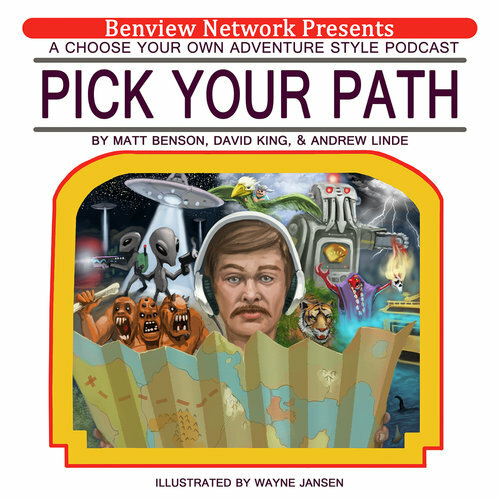 If you wish to pause and read some reviews of Pick Your Path, go to 7. If you want to keep listening/playing, go to 8. If you wish to listen to Pick Your Path and risk being sucked through a gooey portal into another dimension, go to paragraph 8. Pick Your Path is amazing, you think, after an hour of playing it. But then you realise your skin is oozing a kind of icky goo, and the phone slips out of your hands. As you writhe in a pool of your own plasms you think perhaps you made the wrong choice after all. Because if you’d been wearing normal footwear instead of crocs, none of this would ever have happened. GAME OVER.